​AFTER ALL, IT IS YOUR YARD! Our passion and strive for excellence is coupled with hard work, innovative designs and quality craftsmanship. We bring your dreams into reality by creating jaw-dropping landscapes leaving customers with a headache-free landscape for years to come. It is your outdoor space, we want you to love it! SUMMER TIME IS A VALUABLE TIME! With frigid winters we want you enjoying your beautiful landscapes as soon as possible. Time is money, and we know this first hand. From the initial contact, we will visit the job, calculate a fair estimate and give you a start date all in a matter of days. We do not string clients along, and once on the job site, our youth and extreme passion for landscape shines bright as we work in all types of weather, sunrise to sundown, and on weekends. Our top priority is job quality, but in a timely manner. WE DON'T CHARGE AN ARM AND A LEG - I ALREADY HAVE TWO OF BOTH! 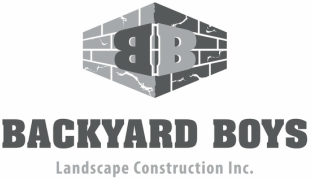 The Backyard Boys are committed to excellent service, and as an Authorized Unilock Contractor, coupled with great natural rock suppliers, our company can offer quality products for quality prices. As a local business, we provide highly efficient service with uncompromised quality as we’re only minutes away. Our drive, passion, and smooth job execution allow us to provide you with the best price for the best quality around.